The winners of The South’s Next Wave: Design Challenge have been announced, but the fun is not over! 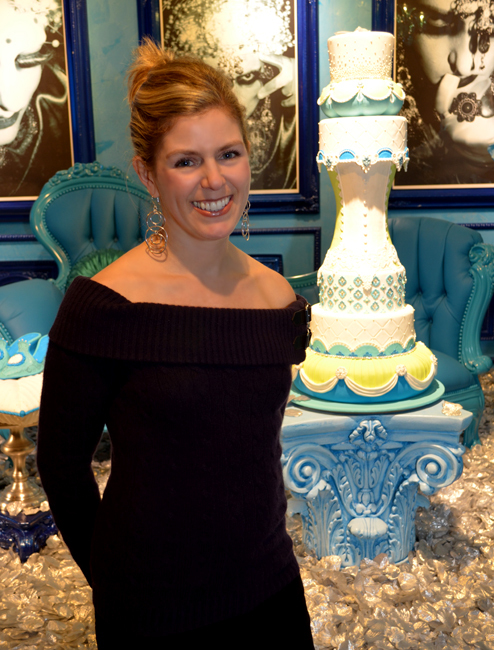 Lisa Humphreys of Couture Cakes, and a member of the winning team of Next Wave, will be featured at tomorrow’s Drink in Design event at the Museumof Design Atlanta (MODA)…and she’s sharing cake! Last Thursday, the winning team was announced at a special MODA Spring Fling event (Which was fabulous, by the way!) where many of the exhibition's 40-plus designers were on hand. The winning vignette, Darkly, Deeply, Beautifully Blue, was created by an impressive team—including Caryn Grossman and Chris Buxbaun of cg creative—of which Lisa was a contributing member. cg creative was featured at an earlier Drink in Design event, which did not include the vignette's cake design knowing that tomorrow's Drink in Design would feature Lisa and her sweet culinary creations. But, we did get to hear a little from Lisa that evening and her enthusiasm for what she does radiated even brighter than the spotlights reflecting off the 35,000 silver flower petals lining the Beautifully Blue vignette floor. This is going to be a great program...and delicious! Oh...AND, we get to help create some sugar flowers for a cake as part of the demonstration. How cool is that?! Doors open at 6:00 p.m. and I recommend purchasing tickets ahead of time. One of the perks of membership—and I've enjoyed mine for more than two years now—is free admission to fantastic programming like Drink in Design, so consider a membership while you're at it.